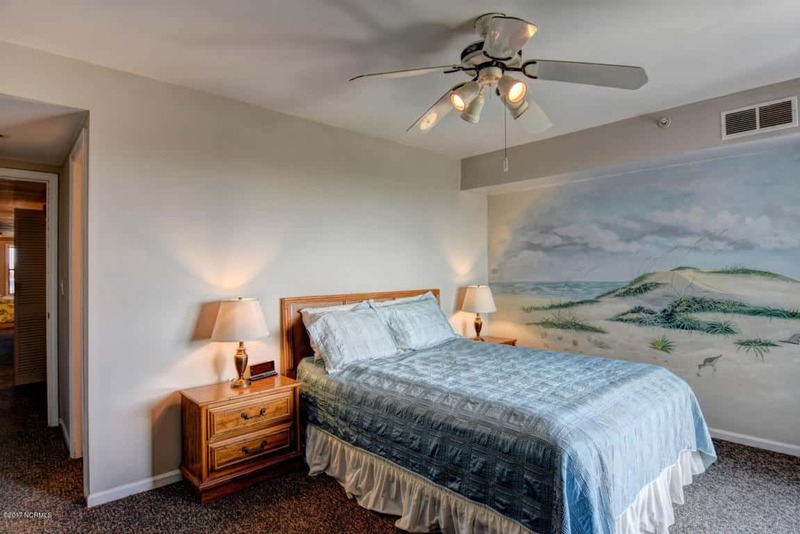 Is your master bedroom looking tired? 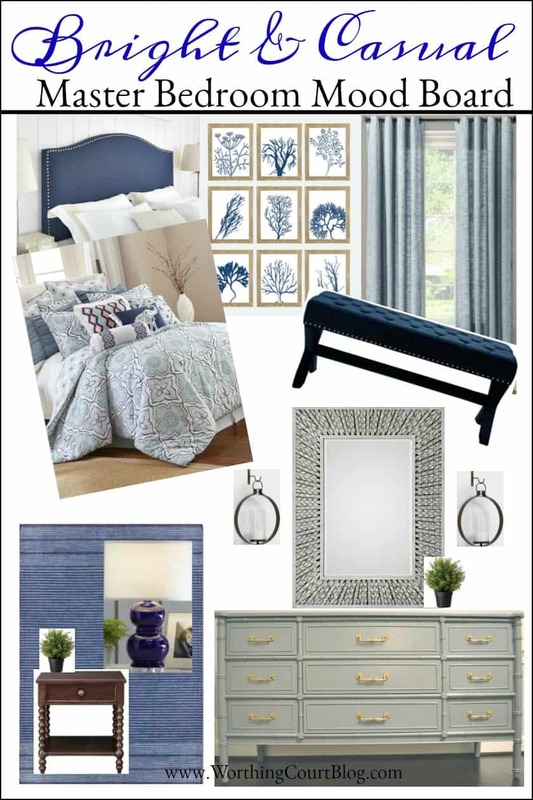 If you’re a fan of blue and white decor, you’ll love these amazing plans for a total master bedroom makeover. 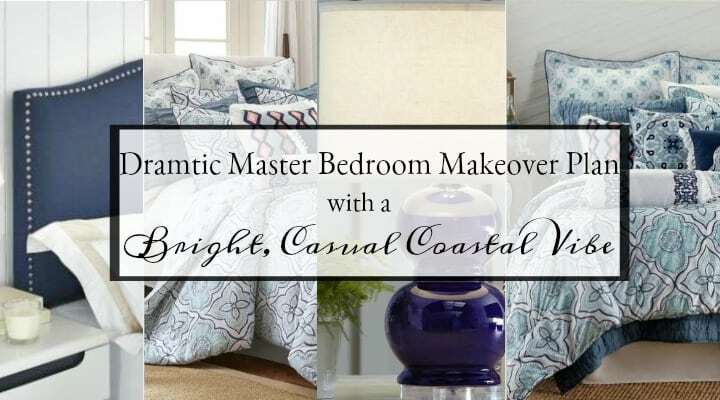 See how you can take your bedroom from dated and drab to bright and welcoming with a casual coastal vibe. 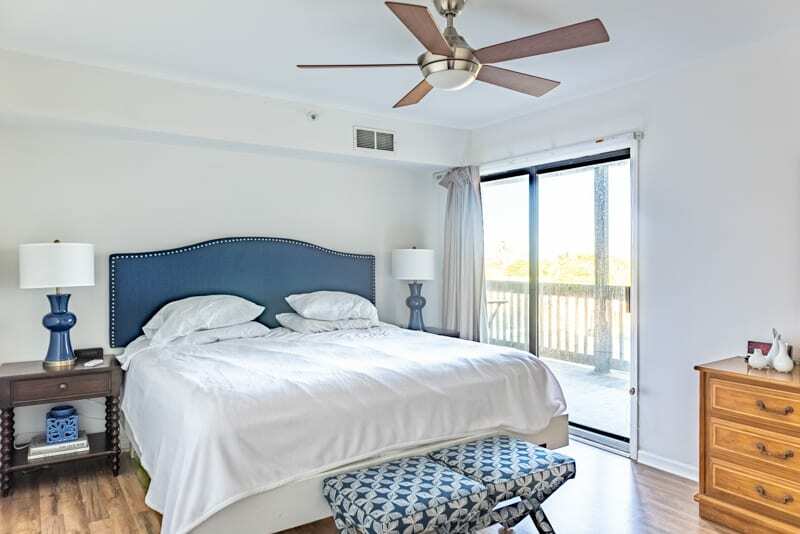 For the last several months, we’ve been working hard to give our beach condo a total overhaul. Even though the structural aspects of the condo were in good shape, the decor in the entire place was dated and definitely in need of some love. The fact that this had been a vacation rental just added to the worn appearance. Now that we have the completion of the dining room, kitchen and living room (I’ll be sharing the reveal soon!) makeovers under our belts, it’s time to move on to the master bedroom! As with the rest of the decor in the space, I’ve been aiming toward a modern farmhouse look with a bit of a coastal vibe. 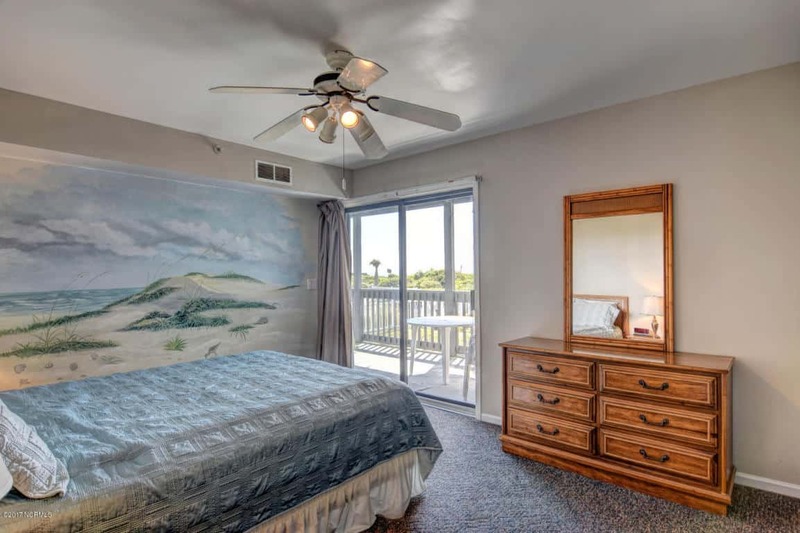 No over the top coastal decor – just enough to reflect that fact that you’re in an oceanfront space. Let’s start off by taking a look at the before. This is how the master bedroom looked on the day that we toured the condo. An uninspired and dreary sort of space with a huge wallpaper mural on one wall. One of the first things that I noticed about the arrangement of the bedroom, is that the headboard was on the “wrong” wall. I much prefer to see a headboard as I walk into a bedroom, but the headboard was to your back with this arrangement. Maybe they wanted to be able to lie in bed and see the ocean, but the whole thing felt off to me. 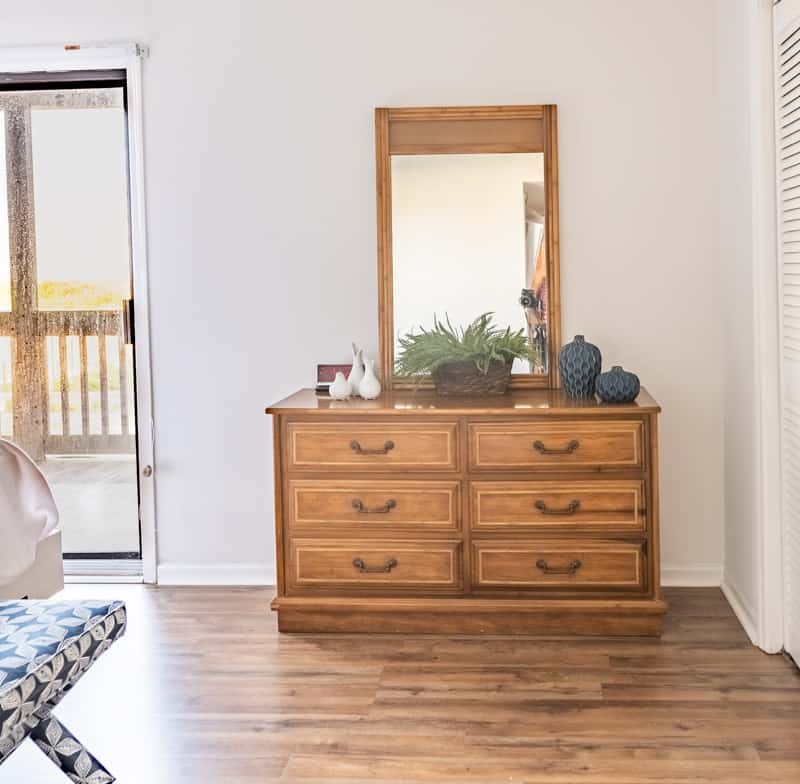 First things first – the wallpaper mural was removed, the walls, trim and closet were painted, the carpeting was replaced with laminate flooring and the ceiling fan was switched to a more updated model. Oh, and of course all of the furniture was removed and donated (except for one piece that you’ll see below). We purchased a new bed and a couple of pieces of furniture, but didn’t do any decorating in here until I came up with a plan. I think that blue and white are a perfect combo for creating a coastal vibe, so you’ll see that my moodboard reflects that. By the way – you can learn how easy it is to create your very own moodboard right HERE. This is how the bedroom is looking today. We rearranged the room so that the headboard is on the “right” wall in the room and that makes me so much happier than the former arrangement. There was just enough room on the wall to add a king bed and two nightstands. 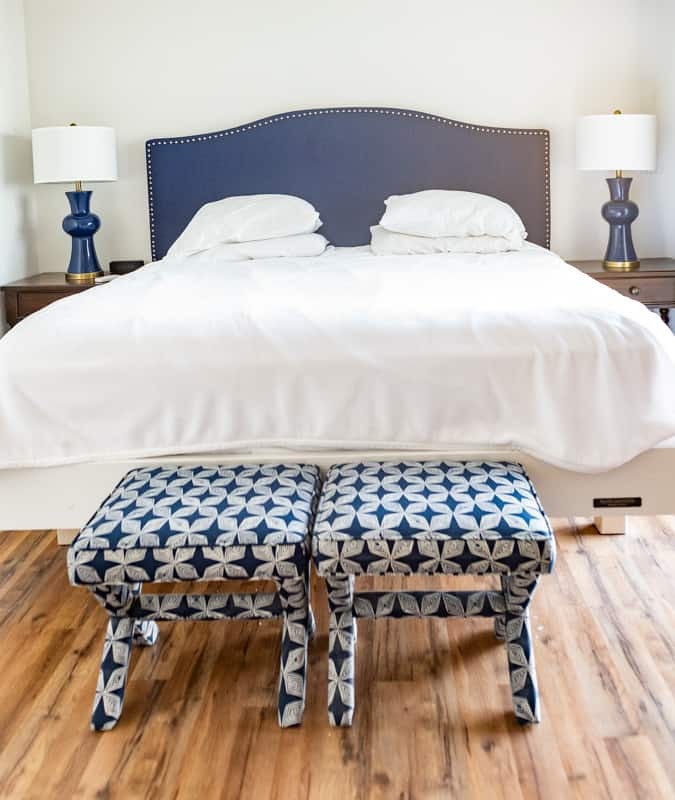 This past weekend we added the nightstands, lamps and stools at the foot of the bed. Fortunately, I already had one of the nightstands and the lamps and stools came out of my bedroom at home. This headboard is the one that I shared in my Friday Favorites: Digest #4 and I absolutely adore it! It came from the Better Homes & Gardens collection at Walmart and was under $150 for the king size. It’s available in three colors and I almost went with the gray version, but in this space I’m sooo glad that I went with navy instead. It’s also available in full/queen for under $110 and can be seen right HERE. This is the one piece of furniture that belonged to the former owners that I kept. How can you not use bamboo-look furniture in a beach setting??? I’ll be giving both the dresser and mirror a makeover with paint to give it a whole new look. I’ve been accumulating several of the items from the moodboard and can’t wait to put it all together and of course I’ll share all of my resources with you! I love the navy headboard and the way you positioned the bed. Looks so much better. I, too, am in the beginning stages of decorating our new beach house. It’s fun but I will be so happy to be able to go and relax! I love those coral prints. I have. I have been looking for some for one of the baths. Can’t wait to see the finished master! The condo looks great!! You are so inspiring! . Your home is warm and welcoming and beautiful. It will be a fun place to relax and enjoy your family and the sound of the ocean ! Looks like a fun room to decorate! Beautiful view. You asked for ideas….my personal preference is for a more neutral drape/sheer or window treatment..,maybe a woven shade? It would bring in more texture. I would also introduce a 3rd color if you haven’t done so, or will it the blush in the patterned pillow? I personally would like to see some more of the bleached wood look to pick up the wood of the coral frames. I think that would tone down the blue decor. Just my thoughts as you are the one waking up in that gorgeous room! Enjoy! How blessed to have that lovely getaway. A soft rose color might look good and not have a beachy look. The one green plant on the mood board certainly add a bright color to the others that you are working with. P. S. The night stands look a bit heavy. Could they be painted or changed out for something not so chunky? You’re spot on with your mood board! Can’t wait to see the finished look. The room looks so much better with the bed repositioned. Love the blue and white but would love to see a pop of color as an accent. Can’t wait to see the finished space. I love what you’ve done with this bedroom! I agree with you that the bed is now on the right wall. And I love all the blue in the room! Your moodboard is perfect! Just beautiful!!! Never can have enough blue and white. Adding a pop of color is not necessary as a blue and white color scheme is a statement of its own. Classic and always respected! I love the bed position and the new headboard. The dresser definitely needs to be painted. The mood board is pretty but until you get everything in place I don’t think you’ll know if it all works as you envisioned! I just changed my bedding and curtains. I quickly learned that while I like “all white” rooms in pictures, it just didn’t work in my space. I just moved the new white drapes to the family room (love the look!) and added drapes in vintage blue to the two windows in the bedroom The new drapes look great with the blue quilt on the foot of the bed. I would paint the dresser before deciding on what color to add to your room. Removing the wallpaper made the duct work disappear. Amazing so far, can’t wait to see the rest. I think it will look soothing and serene. Just what I want in a Master. I guess the beach view will be a bonus. Love the new furniture arrangement. The coral prints are gorgeous. Have you finished this room yet? If so I can’t fix the reveal. Also, do you remember where that blue rug was from on your mood board?